Hi Tom, We've been in the same room on more than one occasion with the first being in a department store in Australia in the 70s, which ended with my (about) 6 year old self in tears because we were fourth from the front of a queue to meet you and you had to go. I'm turning 50 this year, so I no longer cry about it but I remember that day so vividly because you were my hero. I've just finished the Scratchman audiobook. Thank you so much. It was wonderful to hear your voice and your laugh caused me to break out in some of the biggest smiles -- which of course had everyone on public transport staring at me strangely. Your treatment of dear old Harry and Sarah brought tears to my eyes. I can only hope that the BBC will consider doing an animation of it. Thank you. Thank you from the bottom of my heart. I have ASD or Aspergers to be specific. They are very few characters and indeed actors who can make a character who is “alien” yet loveable. You succeeded in Doctor Who. You made an intelligent slightly aloof alien acceptable to the World. Many of those who have ASD struggle to fit into this very confusing world. We adopt masks to fit in. But when we see fine actors, like yourself in Doctor Who, we connect with you. We can enjoy your adventures vicariously and feel perhaps, a little more comfortable with ourselves. I’m pleased I can do this again with ScratchMan. I started it tonight and it is a good read. With sincere best wishes for the future. YOU LITERALLY SAVED MY LIFE!!!!!! YOU STOPPED ME FROM A SUICIDE ATTEMPT. YOU HAVE EFFECTED MANY LIVES BUT YOU SAVED MINE TOM!!!! I hope you read this. I was born in 1964 in the USA and have lived here since. I grew up watching your show here from 1974 into the 1980s including reruns. I was in college suffering from undiagnosed BiPolar. Things seemed utterly hopeless. The night came to say “goodbye” (stupidly). I was watching the Armageddon Factor where you said every Life was sacred and worth saving discussing Lalla Ward’s character. I imagined you talking to me and “putting your Finger aside your Nose with that grin.” I began to cry and remembered how you endured challenges in your life I had read about. Honestly, I thought “if Tom could endure his loneliness and become someone that effected so many lives” you would want me do the same. Sir Tom. I was lucky enough to have my photo taken with you at the London Comic-Con, this year. They say not to meet your heroes. I guess there are exceptions to every rule. Thanks for making a middle-aged man feel like a kid again. Thank you Tom for writing a lovely note upon my husband’s father’s passing. Meeting you was one of the highlights of my husband’s year in England with his dad Eric Defty in the 70s. As we look forward to our first trip to England as a married couple, we were reminiscing about the past. As I plan for my husband’s sixtieth next year, and if you ever get any iteration of this note, I would appreciate a quick or funny reminder of Eric to put in a book that I am trying to organize. Hello Tom, I've always enjoyed your stuff, particularly your wonderful voice. I hope to hear you again soon! My dearest Tom, thank you so much for your hospitality at the London Comic Con. It was amazing to finally meet you after all this time. Your picture and autographs on my memorabilia will stay with me forever. I really am eternally grateful. Cheers to you Tom! I have finished reading Scratchman and was utterly delighted with it. Brings back the essences of my favorite episode of the Pyramid of Mars. Looking forward and hopeful for your next Dr. Who novelization. Best wishes to you! And was like HA that’s “Who” that is. 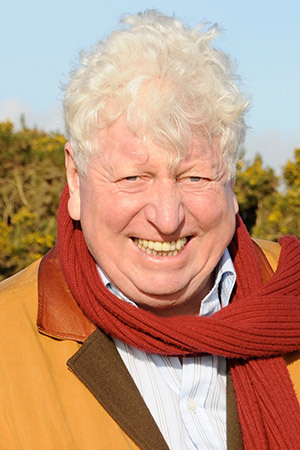 Then my daughter started watching the new Dr Who series and I finally started watching and low and behold there you were again, I remember watching you in the original series when I was just 9 years old and to this day still love your voice and your mannerisms, you will always be in my top five actors I would love to meet. Dear Mr. Baker, For my husbands birthday, I ordered a personalized autographed photograph of you, (the one with the clock in the background and you holding a pocket watch). Now, I must tell you my husband does not "celebrate" his birthday. All he wants is a good meal at the end of the day. Well, we did our "normal" made a cup of coffee and went outside to talk and let him tell me about his day. I handed him his BD card and got the normal aww gee thanks, then I handed him the package your photo came in. He was speechless. He was in AWE! He was blown away. That is the first time I have seen him like that! ( and we have been married for almost 20 years) He says whenever he thinks of "The Doctor" your image always comes to mind, no matter who the current Doctor is. Anyway, thank you for doing this for us. And thank you for allowing me to make his birthday special. You are the best. Just wanted to say thank you for being such an inspiration to me and to so many others. I fondly remember briefly meeting you a little before you switched on the lights at BLACKPOOL ILLUMINATIONS back in 1975. I was big fan of your Dr Who especially as a boy and when I saw you arrive in Bessie, I pushed my way through the throng of other children (wearing the 'Dr Who Scarf which my Auntie Lily has personally knitted for me) to hand you my hand-written note which read. Dear Dr Who ... etc, it was an invitation to come to our house for tea, you took the note and pocketed it and my mission was a success! I was delighted to receive a couple of weeks later, a letter from you saying that 'you were not able to attend our tea, however you thought I might enjoy the enclosed signed photo's of you with some Daleks! It meant so much to me especially as a boy that you would be so kind to send me that package, I have always cherished it. THANK YOU ALWAYS Mr Baker for that very special memory. You were and are the real Doctor to me. I thoroughly enjoyed your novel Scratchman. I just finished and it was a joy to read. I may be mistaken but is this not the first Doctor story written by one of Doctors? That just makes it that much more endearing to me. Again just wanted to give my adulations to fantastic story by a fantastic man. I’ve been a Dr Who fan since 1972 and love what the DW community has given me over the years. I was born in England and moved to Australia when I was 13. At the time the last story I saw in the UK was ‘The Stones of Blood’ and after that I thought I’d never see Dr Who ever again as I didn’t know it was broadcast in Australia at the time. Thankfully it was. To my mind (and many others) you’re the most iconic Doctor. My visits back to the UK since 1978 have been very seldom over the last 40 years but I took a trip back there in 2016. The 23rd June that year I was walking down a London street, I looked up and saw you. I couldn’t believe my eyes! I obviously didn’t want to trouble you too much but I summoned up the courage to walk up to you, say ‘hello’ and thank you for making my childhood (as a Dr Who fan) amazing! It was apparent to me you were busy going about your day but you were still very polite and you acknowledged my gratitude. That day was the highlight of my UK trip! What change is there of a Dr Who fan based in Australia on a UK visit and randomly bumping into you?! I just wanted to thank you for the signed photograph. I know I asked you to sign as the Curator, but you were also my first Doctor back in the 1970’s and it meant so much to me to share that moment on the television with my daughter, who has met the 11th Doctor. Thank you for wonderful childhood memories, and memories I can now share with the next generation. Tom!! I am your Korean fan. I was longing to meet you for many years and finally, you gave me the chance by joining the spring comic con! I looked forward to your participation in this event and when your name was updated on the lineup, I was so surprised and so happy. You didn't just join the event but also you gave great hope and miracle to a boy who lives abroad. can't wait to meet you for the first time! Thank you so much, my doctor! Just finished Scratchman. Great story! It completely enthralled me. Couldn't put it down. Thank you. Dear MR Baker, I am halfway through Scratchman and just had to let you know how wonderful it is I am once again a 12 year old in the '70s, such fun thank you!. Hello Tom! excited to hear that you'll be joining us in London once again for the spring comic con, can't wait to see you, best wishes. You are amazing. I have been listening to doctor who and have laughed millions of times. I think you are the best doctor ever!!! I have been listening to the audiobook Scratch man. You are the funniest doctor who too!!! I am 11 years old and have loved your funny comments in every episode in doctor who. Thank you so much for getting me into doctor who!!! Have a great day!!! Dear Tom, just finished watching the Key to time series. Just wanted to say thank you. I'm 48 but the sheer joy I get when I see your face materialise on your series always cheers me up and brings me back to an age of pure happiness! Just wanted to tell you to have a jelly baby for me please. In Canada I never had them growing up. Weren't available! TOM, I UNDERSTAND YOU WERE IN THE ARMY (RAMC) AS YOU ARE A VETERAN WHY NOT JOIN THE RAMC ASSOCIATION AND MEET NEW OR OLD FRIENDS. AND LIKE DR-WHO DONT THINK ABOUT IT "DO IT"
Dear Tom it was with very great excitement that I rushed to read (on kindle) the very second that your fabulous new book was published! 🙂 I felt back in time full of pleasure as I had watching you on the TV in '79 indeed I felt like that happy child again of just six years old but this time reading at forty five your exploits against the scarecrows and later Scratchman with the old team of Sarah and Harry. I loved your ever so personal and creative tour de force in which you managed to capture absolutely that fantastic feel and atmosphere of those classic who stories whilst still keeping a freshness to it all with your amusing and witty dialogue! Having read your novel once I am now listening to your unabridged reading of the book on CD again and yes I will follow it up with a read of the physical book also. You have given your fans round the world many smiles over many years and this book is another reason to smile. Thank you so much for writing it for Doctor who fans to love and enjoy time and time again. You have given so much back to us your fans and on behalf of everyone I salute you. Hello Mr. Baker! Just wanted to thank you for many years of entertainment. I just ordered an autograph and am looking forward to receiving it. I know you are busy so I won't take up too much of your time. Just wanted to say thanks. God bless. No request. I just wanted to let you know you were my first Doctor and all who have followed had to measure up to you. I hope we can meet someday, but know that to me you will always be the Doctor. And I have a 14 year old daughter who knows you as the “original” doctor as well. Well I'm 47 now and I want to tell you something: When I was seven or eight years old, I was pulled aside by the headmaster who then went on to tell me that I have to stop drawing pictures of Doctor Who. That's right, It's now naughty behaviour to be too into Doctor Who. I had a long colourful scarf thanks to my Grandmother and I was proud to call myself Doctor who fan number one. 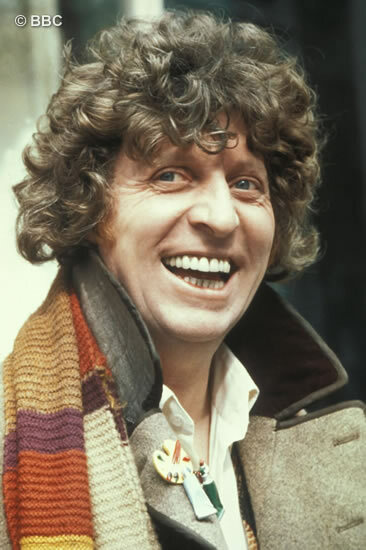 I was unfairly harsh on Peter Davidson and harder still on Colin Baker and Sylvester for the simple reason that Tom Baker is Doctor Who... aaaaaaand always will be. I even had a (long since lost) signed photo of Tom.